The iConverter T3/E3 media converter provides standard T3 (44.736Mbps) or E3 (34.368Mbps) coax to fiber conversion and can be used to connect to devices such as PBXs, multiplexers, routers and video servers via fiber. T3/E3 media converters operate in pairs, extending distances over fiber, which improves noise immunity, quality of service, intrusion protection and network security. The iConverter T3/E3 is a T3 (44.736Mbps) or E3 (34.368Mbps) coax to fiber converter, and is available as a compact unmanaged standalone unit or a managed chassis plug-in module. 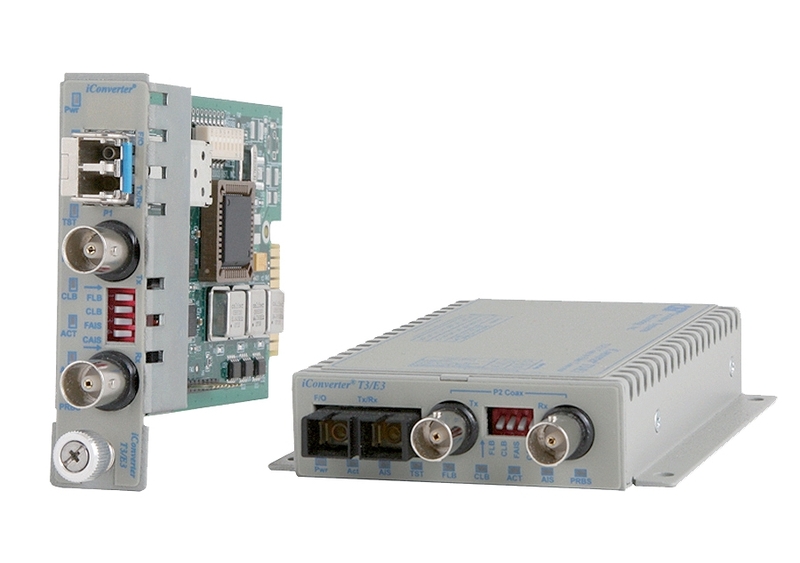 The iConverter T3/E3 can be used to connect to devices such as PBXs, multiplexers, routers and video servers via fiber. The iConverter T3/E3 media converters operate in pairs, extending distances over fiber, which improves noise immunity, quality of service, intrusion protection and network security. The T3/E3 supports both standard and CWDM Small Form Pluggable (SFP) transceivers, enabling adaptability to different fiber types, distances and wavelengths, providing maximum flexibility across a variety of network architectures and topologies. The T3/E3 also supports multimode and single-mode dual fiber with ST, SC and LC connectors; and single-mode single-fiber with SC connectors. Individual coax and fiber port access can be controlled, providing the network administrator with an easy mechanism for controlling usage and access to the network when installed in a chassis with network management. The T3/E3 features extensive local and remote loopback user-selectable diagnostic modes. Local loopback facilitates individual coax or fiber loopback operations. Remote loopback facilitates setting a remote T3/E3 converter to loopback mode, in order to test the integrity of the fiber and the remote converter, eliminating the cost of external hardware or support personnel at each end of the link. Additional diagnostic features include forcing of all 1s data patterns, Alarm Indication Signal (AIS), to the coax or fiber interfaces and generating and monitoring a Pseudo Random Bit Sequence (PRBS) per ITU O.151 specification. These diagnostic features combined with the informative and easyto-read LED display facilitate quick installation, fault detection, isolation and correction. The hot-swappable plug-in module can be mounted in a 19-Module (2U high) or 5-Module (1U high) rack-mountable chassis. It can also be mounted in a 2-Module or 1-Module powered chassis. The T3/E3 standalone unit is available as a wall-mount unit. The wall-mount models are DC powered and are available with an external AC to DC power adapter or a terminal connector for DC power. T3/E3 media converter provides a cost-effective solution for extending telecom demarcation points. A pair of T3/E3 converters is used to extend the demarcation between buildings via fiber. Multimode or single-mode fiber can be used, and fiber links can be extended up to 120km using single-mode fiber. The iConverter T3/E3 plug-in module can be used in managed or unmanaged applications. Management provides remote configuration, monitoring and trap notification. Management of the T3/E3 plug-in module is accomplished by installing an iConverter Management Module (NMM2) or Network Interface Device (NID) in the same chassis. The Management Module can be accessed via SNMP, Telnet, and serial port. The T3/E3 can be managed with Omnitron’s intuitive, graphic-oriented NetOutlook SNMP Management Software or third party SNMP management software. Management via the Telnet and the serial interfaces have an easy-to-use, menu-driven interface. The management software can override the physical DIPswitch settings such as protocol selection (T3/E3), line buildout options, port enable/disable control and all local and remote loopback and data patterns. Some of the real-time T3/E3 parameters that can be monitored include power, link status, module type and model, hardware and software revisions, serial numbers and a user-defined identifier. The iConverter T3/E3 supports SNMP trap notification for the monitoring and notification of different network events. Specific events that generate traps include link-up and linkdown, AIS and PRBS data received, and upon entering and exiting the remote loopback mode. Trap monitoring of specific events can be selectively enabled or disabled by the network management software. Contact Omnitron for extended temperature (-40 to 75°C) and RoHS (5/6) compliant models. Order the appropriate Fast Ethernet SFPs separately. Visit www.omnitron-systems.com/optical-transceivers.